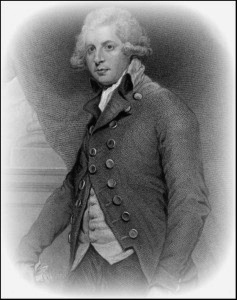 Richard Brinsley Sheridan was a famous playwright and theatre-owner as well as being a Whig politician. His most famous play, A School for Scandal, is still a popular production. House of Commons, March 20, 1796: Maroon War In Jamaica. General Macleod moved, "That an humble address be presented to his Majesty, that he may be pleased to order, that there be laid before this house a copy of all the correspondence of which government is in possession, relative to the mode of carrying on war against the Maroons in Jamaica." Mr. Sheridan did not think it necessary to trouble the house long on the present question, after what had fallen from the hon. 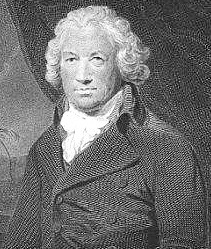 secretary (Mr. Dundas). It gave him the greatest satisfaction to hear that government had ordered an inquiry to be made into this transaction immediately after the report of it came to their knowledge. But he had heard with much concern what fell from an hon. gentleman near him (Mr. Barham), because it carried with it the idea of extirpating a whole race of people. This he could not sufficiently reprobate; and surely the savage means used to overcome those unfortunate men were not necessary, when their number was stated so low as four or five hundred. 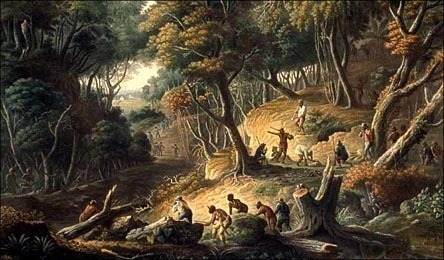 It was surprising, that without the abominable aid of bloodhounds, the whole force of Jamaica could not succeed in subduing those unfortunate Maroons, who, by oppression, the breach of treaty on the part of the English, and in vindication of their rights, had been driven to take up arms. So far, by the blessing of God, the resistance of a minority, acting on just principles, in one quarter of the globe, was at least formidable. The hon. 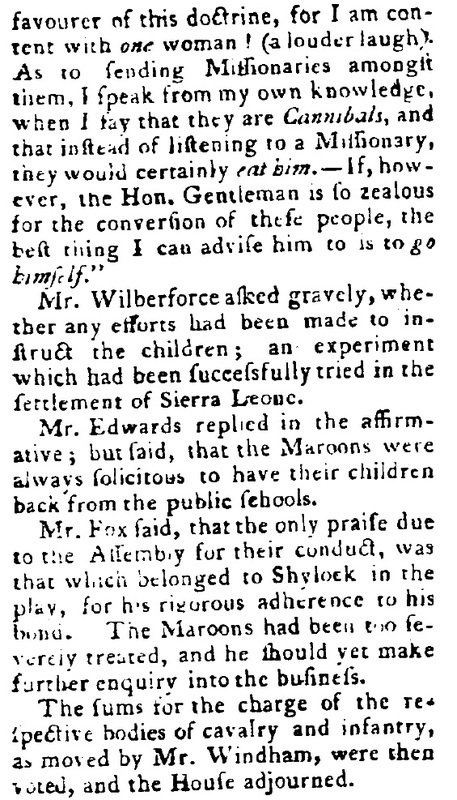 gentleman who spoke last asserts, that they were not to be treated as Maroons but as rebels. Now it seems that the resistance of an independent nation, with whom this country signed a solemn treaty, which it afterwards violated, was to be considered as a state of rebellion. But there was no ground which could justify the use of blood-hounds; and it was unnecessary for him to state, what the house well knew, that it was not only just, but politic, to abate as much as possible the rigours and horrors of war. The present objects of the war in Jamaica, seemed to be the extirpation of this unhappy people, or to drive them by cruelty to nourish such a resentment of their wrongs, as to render them incapable in future of observing amity or good-will towards their enemy. The hon. gentleman opposite to him seemed to consider it as of little importance, whether the war was just on our part or not. He was of a contrary opinion. The idea of extermination, always horrid and unjust, was certainly much aggravated, if it turned out that these people were at war with us merely because they had been injured. The Maroons were, in fact, an independent people. They were a useful race, and even, in a commercial view, were of considerable advantage to the country. The hon. gentleman had mentioned the origin of the war, but he had not stated all the circumstances. 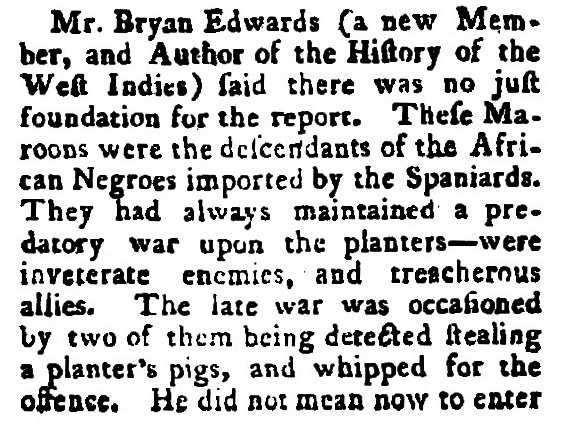 It originated in a Maroon stealing a pig; but his punishment was a violation of a treaty which subsisted between the British settlers and the people. He was whipped. The man returned with his stripes on his back to his nation. It was an article of the treaty that no Maroon should be punished by the government of Jamaica; but if he committed a crime that he should be given up to his own nation for punishment. In the present case, this article was evidently infringed. Redress was demanded by the Maroons, and as no redress was given, war followed. For the honour of the national character it was necessary that an inquiry should be instituted. If the Maroons were injured, a war of extermination could not be contemplated without the utmost horror. He hoped, however, that something would be done to bring back this people to that state of harmony and good-will which had been found so necessary for the peace, and, in some degree, to the prosperity of the island.